Engineers have used deep tunnel storage facilities and associated dewatering pump stations for addressing combined sewer (CSO) and sanitary sewer overflows (SSO) in the U.S. since the late 1970s. Although the use of deep tunnels for CSO and SSO control is becoming increasingly popular, these types of facilities still are not common in the municipal wastewater industry. There are few examples to offer any historical data to a utility, and only a few design engineers have had experience implementing such projects on a repetitive basis. It is the non-recurring aspect of design that can lend itself to potential long-term problems without proper planning, knowledge of best practices, and appreciation of the details are critical to what can be one of the most expensive single assets in a wastewater collection system. There are many lessons that can be learned from studying existing installations. Applying this experience while driving technological innovations in this specialized field can yield great results. Below is a look at some of the issues that make planning, design, construction and startup of deep tunnel pump stations different than a typical wastewater lift station. One of the first, and often most important tasks, is to identify the optimal configuration for the new pump station. This decision will impact both the initial capital investment, as well as the long-term operations and maintenance of the facility. Wet pit submersible pump stations typically have the lowest upfront cost, however, submersible pumps are limited in the available motor size that can be fitted to them. Therefore, the overall depth of the station may eliminate this as an option. Additionally, debris accumulation from deep tunnels must be considered when selecting a wet pit submersible configuration as these pumps can become inundated during the first flush. If pumping depth is beyond the range of electrical motor submergence or if direct pump access is important, a dry pit configuration can be considered. In the case of a dry pit installation, the use of large-diameter shafts versus smaller access shafts terminating in a rock cavern are two of the most common dry pit configurations. Geology, surface constraints, access requirements and overall depth can dictate which system makes the most sense when integrated with the remaining system infrastructure. A recent, successful deep tunnel pump station project—the Easterly Tunnel Dewatering Pump Station (ETDPS)—undertaken by the Northeast Ohio Regional Sewer District considered all the above circumstances. The pumps are at the heart of these facilities and all corresponding design decisions needed to be weighed around them. One situation common to deep tunnel pumps is the extreme variations in suction head conditions. If pump sizing and selection are not done carefully, it likely will result in shortened pump life. In most cases, tunnel dewatering pumps need to be able to operate at near-empty tunnel conditions as well as full-tunnel conditions, which often is at or near the surface. This makes selection and operation of a pump that can handle such a wide range of static conditions challenging. Alternatives, such as the use of variable frequency drives (VFDs), are common and sometimes used in conjunction with discharge throttling valves to impart additional head during high suction head conditions. If circumstances dictate, employing more than one set of pumps with each set capable of pumping the required flow at the extreme tunnel level conditions may need to be deliberated. The typical refrain—often heard early in the project—is “use the tunnel shaft for the dry pit.” While it might seem logical at first, this can be difficult, if not impossible, to do as the optimal pump station shaft is being used for tunnel construction for the project’s duration. When using a shaft-style dry pit configuration, the tunnel shaft is used for influent flow control or screening before getting to the pumps. In this case, project delays can be minimized as the pump station and the tunnel can be constructed concurrently. Deep tunnel systems and their associated pump stations are, by their very nature, moving large volumes of water. Careful consideration of tunnel and pump station influent hydraulics is a necessity. Computational fluid dynamics modeling, once considered an innovative approach, is a good first step employed early in the design process. In many cases, a physical hydraulic model of the pump station is recommended and required in deep tunnel installations to accurately evaluate intake conditions. Not only does hydraulic modeling simulate the hydraulic response of the system to different inputs, but today’s tools allow observation and evaluation of hydraulic phenomena at a higher resolution. For instance, seeing the angles at which flow approaches the pumps and identifying the presence or absence of vortices that could harm pump performance can be found using this process. In addition, by extending the modeling exercise past the pumps and up to the surface, these findings will help optimize the station’s reliability and design. There is no escaping debris in a deep tunnel pump station. Debris is going to enter the pump station, whether it is in the form of heavy sediment, rocks and grit, or floatable solids such as wood lumber, old shoes or plastic grocery bags. The best deep tunnel pump station design takes into account a reliable strategy for debris management to reduce long term operations and maintenance headaches before they become nightmares. On many occasions, both utility staff and design engineers express concerns about the possibility of dry pit flooding in deep tunnel pump stations. The odds of a dry pit flooding from either the tunnel, the pump suction piping or the pump discharge are relatively low due to the materials used and the physical size and pressure rating of the piping, fittings and valves. Conversely, the odds of a dry pit flooding from a broken water supply line to the pump seals or wash down water is much higher. The industry has trended towards using dual dry pit chambers to contain potential flooding to just half the pump station which would avoid a complete station outage. However, consideration should be made for smaller system improvements like flooding alarms that automatically shut off water lines at the surface or the use of larger sump pumps that can help mitigate flooding concerns at a fraction of the cost of dual dry pits. To VFD or not to VFD? The wider operating ranges required in deep tunnel pump stations lend themselves to the use of VFDs. This is a decision that should be made on a case-by-case basis. Many deep tunnel pumps require large motors, so if backup power is employed specifically for a deep tunnel pump station, the use of VFDs can greatly reduce the size of the generator(s) required due to the lower starting current. On the other hand, pump design and operational flexibility gained by VFDs can be offset by added complexity, costs and adding another point of failure in the system. This is a decision that should be made on a case-by-case basis. A look inside the ETDPS cavern that pumps 160 mgd to dewater two CSO storage tunnels and convey flow to the Easterly Wastewater Treatment Plant within a 24-hour time frame. With the length of vertical discharge piping required in a deep tunnel pump station—often ranging from 100 to more than 300 ft—the water column in the discharge pipes will tend to flow by gravity back into the tunnel, causing pumps to spin backwards in the process. Even though pumps and motors can be designed to spin backward, the dramatic fashion of this occurrence can cause long term vibration issues. In extremely deep stations, free backspin can be highly damaging. The deeper the pumps, the worse the problem. In such cases, proactive backspin protection must be used. Typically, in shallower pump stations, swing check valves are employed and can cause severe hydraulic transients as water slams back against the check valve. In deep tunnels, due to infrequent use, solids can settle and limit or impact pipe and valve operation the next time the pump is started. Draining back the lines after pumping is complete can help resolve this issue and save an odorous pipe situation. Free backspin is a significant cause of pump and motor vibration in deep tunnel pump stations. Like all pumping systems, normal system operations also can be a recurring cause of excessive vibration reducing the service life of the pumps. Deep tunnel pumps sometimes are being asked to operate on the edge of their design capabilities due to the extreme variation in suction conditions. This, coupled with the discharge head of pumps operating at higher speed, means pump casing, impeller and motor support design all should be managed with extreme care. Motor Cooling. Due to the head and flow requirements for these types of stations, deep tunnel pump motors tend to be rather large. Typically, air-cooled motors are the lowest cost alternative on a life cycle cost basis. However, getting the required air down to the dry pit and back up again can take up a lot of valuable space. Under the right circumstances, water-cooled motors can eliminate the need for large ductwork, thereby greatly reducing shaft size requirements. Single Points of Failure. Deep pump stations often are critical infrastructure to a utility. In many cases, the equipment is the largest in a utility’s system. It is important to think through all potential points of failure to stay ahead of the game and maximize the utility’s investment. Air Release. Air is inevitably going to become entrained in the pumped fluid. Proactive measures to release large volumes of air will reduce problems associated with air entrainment, such as reduced hydraulic capacity and pump cavitation. While large-diameter tunnels have been used throughout water’s history, deep tunnel pump station design has gone through few design iterations since the first station in the 1970s. 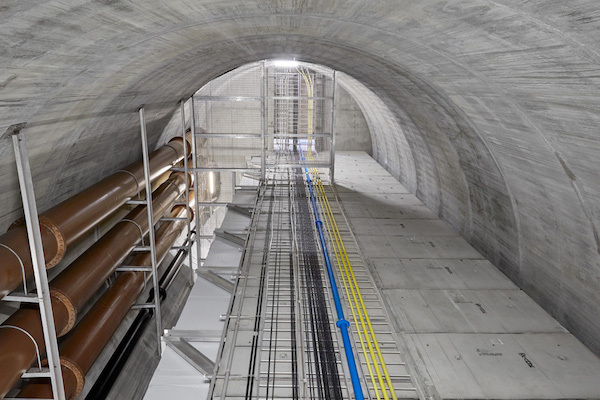 As deep tunnels become more commonplace for CSO and SSO control, do not forget each deep tunnel system is highly custom and requires specialized expertise in the planning, design and construction phases to make the operations of deep tunnels and their associated pump stations more effective, reliable and resilient.